Yep, the motor is not balanced to idle on 4 cylinders, the thing would be vibrating like crazy. Well the 6o degree engines are great to have a smooth idle but on six. They do it with no balance shafts. The 4.3 is a 90 and has the shakes even with all six cylinders and needs balance shafts for help. You have to keep the type of engine in mind. We will never see cylinder drop in a 4 as there are just limits. You don't need a car to run like a Deere. the 4.3 5.3 and 6.2 idle so damn low (500rpm) they are bound to shake. 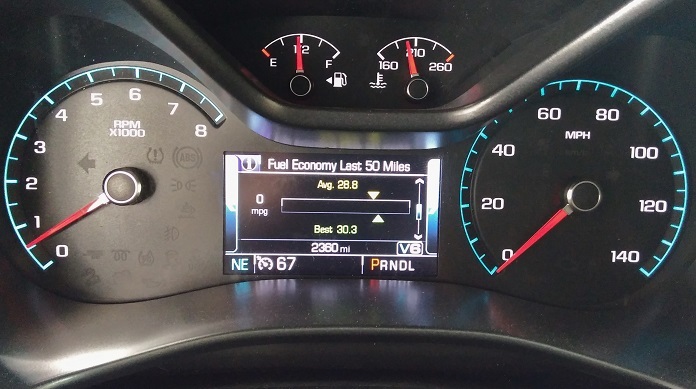 When I had my 2014 Sierra with the 5.3 I had it tuned to raise the idle rpm to 600 and it idled SOOOO much smoother. I notice my 3.6 on my Coly has a slight idle vibration, not as bad as my Sierra, but its there, I bet if I had it tuned to raise a bit, it would be smooth as glass as well. But asking the motor to idle on 4 cylinders is stupid. I doubt it would even save on gas. There is more to it than idle speed. the nature of the degree the cylinders are play a part in the smoothness of an engine. A V8 is better at 90 degrees between banks where a V6 is better at 60 degrees. The timing the firing plays a big parts. This is why the 3.6 Buick and the 4.3 Chevy always were much rougher than the 2.8 or 3.1 V6. Also the 60 degree fit the FWD applications better and have no need to have balancing shafts to smooth them out. The 4.3 only existed as it shares parts with the V8 making it cheaper to make. In the early days they removed two pistons from a 350 Chevy. Today while they have put a little more engineering in it they still use many of the parts from other GM V8 engines. I remember that Cadillac 4-6-8 cylinder technology from the 80’s. It was a big headache and was a FLOP. Surely it has come a long way, I hope. Added features and technology, just means more features that can cause problems. Yes, the Cadillac 4-6-8 V8 engine was "ahead" of it's time. It was a stretch of technology and mechanical design at the time for it to work well. Our family had two friends that owned a Caddy with that engine. Today, whether the cylinder deactivation really saves fuel in real world driving or not is a question. I know driving around town at low speeds I glance down at the instrument cluster now and then and see it is in V4 mode. I can not tell when it is unless I look. And all it takes is a bit of gas pedal and right back to V6 mode. Hopefully, it will be durable and not cause expensive repair issues down the road. Else we will see a lot of vehicles that use it headed for the scrap yard and/or enterprising wrenchers who can buy a dead vehicle on the cheap and repair it to make a few $$$$ on the used market. What's the point of switching to V4 mode if the engine isn't delivering power? Does switching to V4 save that much gas during idle? It seems odd to me that it isn't capable of propelling itself with 4 cylinders, even in city driving 25-35mph, as it should be more than enough unless you pounce on the gas. Oh .. it does power the vehicle somewhat. The engine goes into V4 mode under light loads like driving along at slower speeds (25 to 35 MPH or so) in town and even at highway speeds I've seen it drop into V4 mode at 60 to 65 on level terrain or very slight long down hill grades. . .. again when the engine is under light load and little gas pedal. I guess the theory , on paper, is that under light engine load why use fuel in 2 of the cylinders ? I guess I assumed it would be in 4cyl mode 80% of the time for gas-saving purposes, switching only when you drive aggressively, or when you're hauling/pulling something. Interesting. Our v6 usually only goes into v4 when 35 or slower with the slightest throttle touch. Ive only had it turn on on the highway once with real high winds behind me. Youll need the V8 if youre wanting more v4 mode. With stock gears I would only see V4 when less than 2-3% throttle, now with 4.10's I see V4 more often and can go 5-8% throttle before kicking out. I see it speeds from 15 to 75 mph. Hows the 410's treating you? My ZR2 goes into V4 mode pretty often. It seems that it will drop into V4 mode anytime the road is on any sort of downhill or when I'm on a flat road as long as I'm not in a headwind. Of course that is as long I am not accelerating. I see my truck switching back and forth all of the time. How do you know if it is in 4 Cylinder mode? Is there an indicator? Yes . . there is an indicator on the DIC. It is normally in V6 mode. . . then turns color to Green and displays "V4"when in that mode. Last edited by GraniteBlue05; 04-14-2019 at 01:41 PM. The mistake is that many think this is about MPG. The real reason for this is more about the off cycle credits the MFGs earn. The fuel saving is there but negligible. But the credits earned by the MFGs are great. The system works today mostly due to the computer abilities we have today. Killing odd the cylinders mechanically was not difficult but getting it so work seamlessly was difficult. Today’s sensors and computers are light years ahead of what we had in the 80’s. The off cycle credits are more about emissions that can not be measured in normal driving and the government awards credits base on the added technology. Here is something that better explains what is going on today with some of the technology we are seeing used. These credits are widespread in what is counted and how they are used. Everything from cooling seats, paints, cylinder drop, special glass etc can be counted. So if something that makes little sense is being used that appears to not save much gas it may be more for emissions. The Start Stop systems are a part of the Off Cycle program too. It is another thing seen as cutting emissions. Automakers may market the as fuel saving as they may to a small degree but most of this is due to emissions. 4 cylinders polite less than 6 or 8 when not under power. The 4.10's have been the best change I have made to the truck. I have the Trifecta tune so my truck drives different than stock. It's a night to day difference with the gears. Only draw back is cost, $1800 would be cheap. Your still looking at $700-800 with DIY. I've done a hundred or more gear sets when I was racing and twisting wrenches for a living, it's easier to part with money at this point in my life. Agree with that. Wrenching is fun . . . but I like driving the results much more these days and having someone else get dirty. Last edited by GraniteBlue05; 04-14-2019 at 04:07 PM.